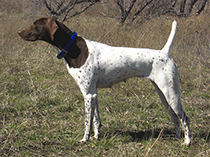 I have come across quite a few GSPs with "Impressive" in their bloodlines, but my searches for info specifically on that one turns up nothing; anybody have any insight? Would love to find out more. Lots of dogs down from shill's rest stuff. Some rusty via blue earth rexx also. Rob is a good guy. Thanks guys. My husband and I rescued a GSP, but he was AKC and all. We registered him and got his pedigree- lots of "Impressive"s on the dam's (Yankee's Impressive Abbigail) side. He's proving to be a seemingly excellent pup! Eager to please, sharp as a tack- holding point and retrieving at ~9 months. We planned him as a hunting dog, hopefully both for upland and waterfowl, but now we're getting the FT bug! Gun dog bug in general...pretty sure we'll be accumulating and developing more GSPs soon. So, very eager to learn about what we have! Are you looking for DC Shillrest's Impressive? That's Kathy Kurtz from Pa. The dog was a true natural in fact what I would consider a really good dual in both venues. Check out my Chevy dog on my website www.horizonkennelsgsp.com Chevy is on the bottom of the Kennels page! He is a throw back to Shillrest! Meires Son of Impressive was a 1xCh. Call name was Blue..
My first dog was out of Blue. Brandi will be 16 yrs old next month, and still plays with the young boys. She has produced 3 Futurity winner/runner ups, multiple National AKC and AF Champions and many FC and AFC. Was '06 Dam of the year of Field Trial Dogs. Blue's Dam was linebred and had many dominant Nat. Ch behind her. Brandi taught me how to bird hunt and how to win the Nationals.